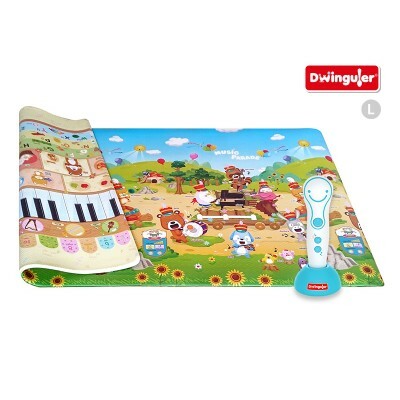 The Dwinguler "Music Parade" Sound Mat is interactive! The included "Talking Pen" plays sounds, music and words when held on the Sound Mat's surface. It is bilingual and allows children to learn numbers, letters, animals and objects in a playful way and even play music instruments! The standard language setup provided with the "Talking Pen" is English/German. It is possible to obtain the following language versions on request (per email): English/French, English/Spanish, English/Russian and English/Chinese. In addition the Dwinguler Sound Mat features all qualities of a Dwinguler Playmat - it is 15 mm thick & soft, it provides an optimal playground by protecting children from hard impacts, isolating from cold/warm floor and reducing noise. The absolutely free from any harmful substances Sound Mat is double-sided and can be used both - in- and outdoors. The anti-slip surface of the Sound Mat is made out of acrylic and urethan leaving no chance for bacteria to spread. The inner PVC foam has been especially developed for babies and children to provide optimal cushioning. In addition the Sound Mat is easy to clean - just wipe with water, and can be used with floor heating. Like all other Dwinguler products the Dwinguler Sound Mat has been tested and certified to assure 100% lack of harmful substances and match the European and US toy safety standards. The Dwinguler Sound Mat comes in Large size - 2,3m x 1,4m x 15mm and fits exactly into a Dwinguler Castle. "Music Parade" - Let's make sound!